Twitter and LinkedIn are two of my favorite places to build your personal brand. I’ve talked about what your personal brand is and why it’s important so in this post I want to focus specifically on what you can do on Twitter to make that brand shine! 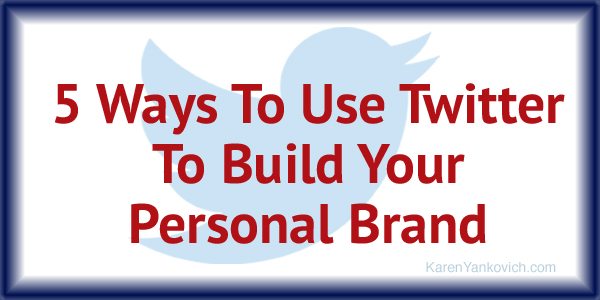 Here’s how to use Twitter to make your personal brand shine! In Twitter land with 284 million active users, your name may very well be taken. And that’s ok. You don’t have to tout the brand of you in every which way especially if you are a service or product based business. Be clear and simple. If your personal brand is about having fun, then have fun with it! And leave @JoeSmith1998 for the other guy. I know I’ve talked about these specific tips a lot but it is that important and deserves to be repeated. Make sure you have a professional headshot as your photo or a clean logo design if you are showcasing your business. Fill your short bio section with a few keywords, a call to action and a link to your website or opt-in form. Finally add your location. This helps make you more visible in targeted searches, and frankly people like to know where you are from. Bing, bang, boom! Your soon-to-be followers and prospects just got a nice shot of who you are and what you do. I am a huge fan of using social media to showcase your expertise. This is a big piece of your brand and one that Twitter can help you with immensely. A few simple strategies as you start is really all you need. First, if you blog regularly you should make sure those blog posts show up in your Twitter feed, linking back to the post and ultimately to your website. Second, anytime you write an article or post an update on LinkedIn you should set it up to also auto-tweet to Twitter. This literally takes 30 seconds. Third, watch for trends or topics that are in your niche to come up in the media/social media sphere and then comment on them! One easy way to do this is to set a google alert to give you a heads up when that topic, name, or company has been mentioned online. You can then read what’s happening and comment on it with your best professional expertise and advice! Create public Twitter lists that will become a resource for those who need the information you provide. For example if you are building a business helping writers, set up a Twitter list of agents for them to follow in each genre. If you are a life coach create a Twitter list of other Twitter feeds that you find smart, inspirational, and full of good advice. If you are a financial planner make sure to have a list of the best financial tools, news sites, and resources that are on Twitter. And everyone should have a Twitter list of those in their field that they listen to, admire, and learn from. Your prospective clients will appreciate learning from them too. 5. Share and engage like you would in person, it’s social selling! A fair portion of your tweets should actually be re-tweets, which is sharing in the Twitter world. This sharing and then engaging after the sharing is just like social networking, only in the online world. Be sure to ask questions of businesses and people who are at the top of your arena. Engaging influencers (those who have a lot of followers) in your niche gets you noticed and ultimately increases your standing in the Twitter follower field. One way I like to remind my clients about building their brand is by telling them to, “Ask yourself: Who would you be at a networking event? How would you act? Then be that, but online.” It’s you, only better and that’s brilliant. Need some more advice on building your brand on Twitter? Come join me in my LinkedIn group where we ask any questions, we share and we care about helping entrepreneurs like yourself. I have most of those covered, but I need to get better at tweeting my blog posts more times, and setting up a list of people who need what I do. That’s such an easy addition Linda! Ranae, It’s going to be a good one! Thank you Karen for the expert advice you keep providing. Great piece there. I too have always wanted to use twitter to build my brand. Therefore this piece is timely. Looking forward to read more of the same from you.